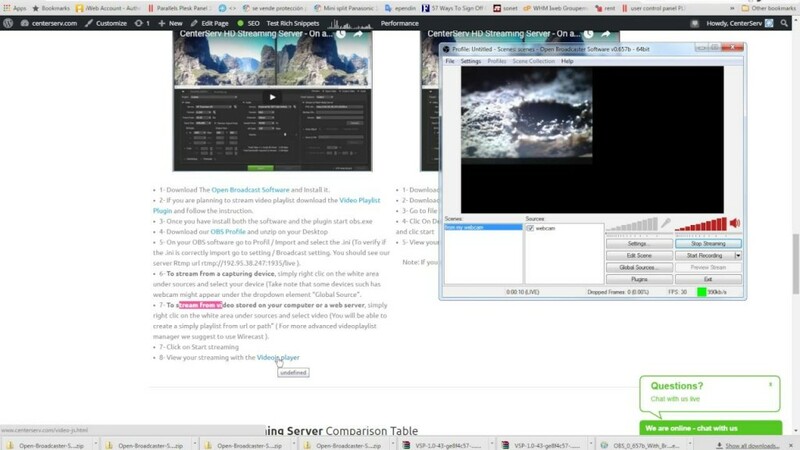 Demonstration for video live streaming in 60 seconds dealing with CenterServ Hd Streaming Servers with Open Broadcasting Computer system software application. 1- Download The Open Broadcaster Software from https://github.com/jp9000/OBS/releases/download/0.657b/OBS_0_657b_With_Browser_Installer.exe and Install it. 2- If you are planning to stream video playlist download the Video Playlist Plugin from https://obsproject.com/forum/resources/video-source-plugin.20/ and follow the instruction. 5- On your OBS software go to Profile / Import and select the .ini (To verify if the .ini is correctly import go to setting / Broadcast setting. You should see our server Rtmp URL rtmp://192.95.38.247:1935/live ). 6- To stream from a capturing device, simply right click on the white area under sources and select your device (Take note that some devices such has webcam might appear under the dropdown element “Global Source”. 7- To stream from video stored on your computer or a web server, simply right click on the white area under sources and select video (You will be able to create a simply playlist from URL or Path” ( For more advanced videoplaylist manager we suggest to use Wirecast ).